Improve and reinforce the vocabulary skills of your students with challenging and motivating worksheet activities created with Vocabulary Worksheet Factory. It is the ideal resource for spelling, language arts, ESL instruction, and vocabulary enrichment in any subject. 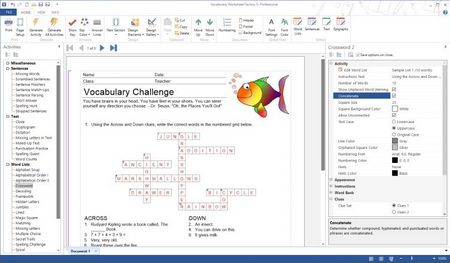 Designed for educators as a resource to support classroom instruction, but ideal for anyone interested in making word searches, crosswords, word jumbles, and other vocabulary puzzles and activities, Vocabulary Worksheet Factory is the ultimate all-in-one program for vocabulary education and entertainment. With the ultimate in worksheet generation technology at your fingertips, the creation of lesson-enhancing support materials for the classroom will be a lot more enjoyable and a lot less work. You can create individual or class sets of professional worksheets quickly and effortlessly saving valuable preparation time and resources. Producing a vocabulary activity for your students is as simple as selecting an activity type and then adding a word list, sentence collection, or text file. The program then takes over and does all the work. It automatically generates a solution for the activity and lays it out on the page so you can see exactly what the printed activty will look like. Generate a basic worksheet and send it to the printer in seconds. But if you want to spend a little extra time, you can customize numerous options to create a very original worksheet to complement a particular lesson theme, grade level, or season. See exactly what your vocabulary activity will look like on the printed page as you design it even when you change paper size, margins, or orientation. You can even work on more than one vocabulary document at a time with the handy tab document view which allows you to easily switch between documents with a click of a mouse. The cloze creator built into Vocabulary Worksheet Factory provides educators with a fast and easy way to generate cloze tests for their students. 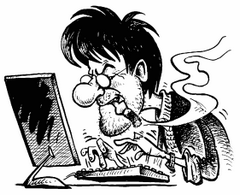 A cloze test is a reading comprehension exercise involving a text with selected words deleted and needing to be replaced. With Vocabulary Worksheet Factory you can take any passage of text and instantly turn it into a cloze worksheet. Create word searches from any word list in seconds. Hide the words in up to eight directions. Jumble the words in the word bank to add a degree of difficulty. Or provide a greater challenge by using clues in place of the word bank. Select from a wide variety of configuration options for your word search puzzle that will make it suitable for students of any age. Then simply print as many copies of the puzzle as you require, along with the automatic answer key, and watch your students dig in! The Sentence Parser is a new addition to Vocabulary Worksheet Factory. Take any sentence collection, and quickly remove specific words, groups of words, or parts of words creating a variety of activities to teach and reinforce correct sentence structure. 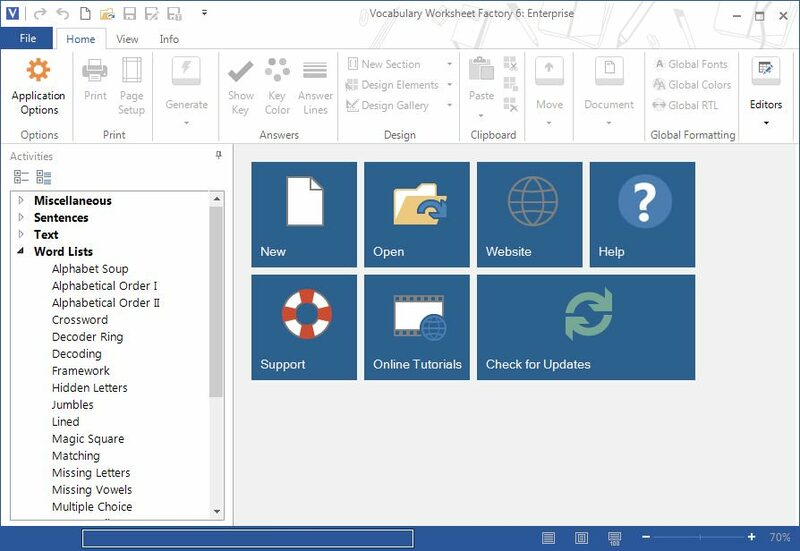 The new Vocabulary Worksheet Factory 6 incorporates an advanced design that allows multiple activities to be included in a single document. Now you can create vocabulary enhancement materials in one convenient and efficient package. Vocabulary Worksheet Factory is a must-have tool for spelling instruction. Never search for additional support activities for your spelling lessons again. There will always be entertaining and skill-building follow-up activities. There will always be interesting and challenging exercises for the speedier students to do. And there will always be fun and educational worksheets to send home for practice.